The allure of the dagger is longstanding, and mankind has always held a dynamic relationship with it. Throughout many civilizations, daggers have been used as weapons. In prehistoric times, daggers were made of flint or ivory. In Egypt, there were daggers made of gold. Even during the Vietnam war, U.S. soldiers carried daggers. 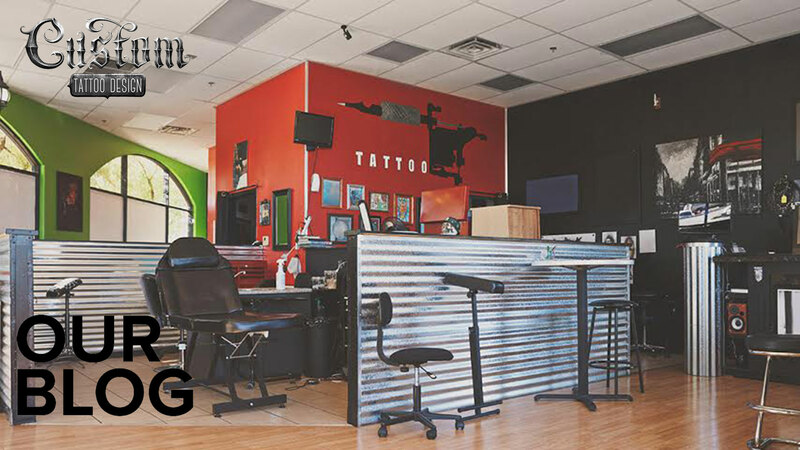 Below, we’ve put together a dagger tattoo dictionary, spelling out the meaning behind some of these unique tattoo designs. 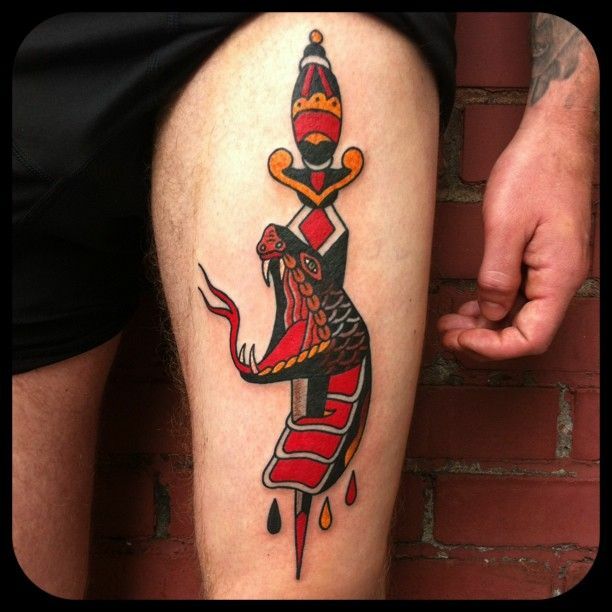 Bloody Dagger: one of the most popular dagger tattoos, the bloody dagger is a symbol of death and sacrifice. Dagger Piercing a Cherry: an ancient Chinese symbol, the Dagger Piercing a Cherry tattoo design represents immortality. 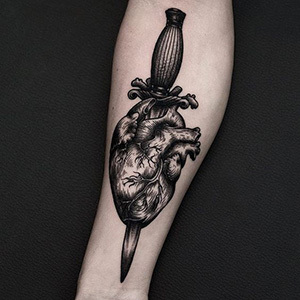 Dagger Piercing a Heart: tattoos of a dagger piercing a heart are symbolic of betrayal or lost love. 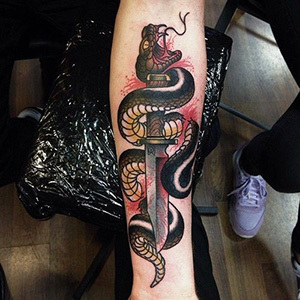 Serpent around Dagger: a serpent wrapped around a dagger represents the Roman god Mercury. 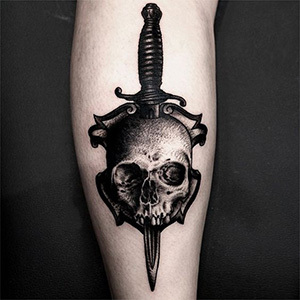 Skull and Dagger: together, the skull and dagger tattoo designs symbolize death, protection, and bravery. 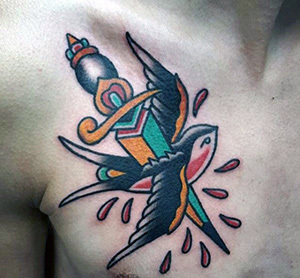 Swallow and Dagger: popular amongst sailors, the swallow and dagger tattoo design represents prosperity, good luck, and safe passage. Daggers have a long history with mankind. 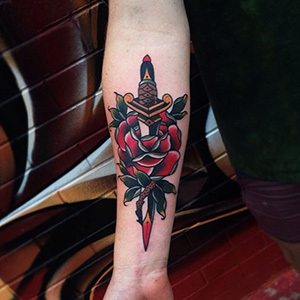 Whether they stand as a symbol of death or a symbol of romance, daggers are rich in meaning, and they make powerful tattoo designs. 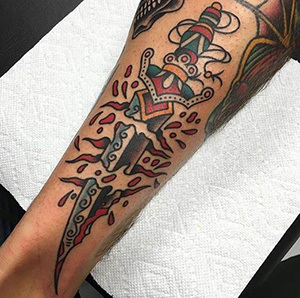 If you know of any other interesting dagger tattoo designs, let us know about them in the comment section below!